HF: Of primary interest to us I think, is Dairy Farm’s production rather than its retailing outlets. As far as I know it is no longer involved in the former which included dairy products and ice. The company has had a long and reasonably complicated history both in Hong Kong and elsewhere involving acquiring other firms and being bought itself. I thought it would be useful to show a timeline which is largely based on Dairy Farm’s own timeline with added information from other sources. Dairy Farm International Holdings Ltd is an Asian retail company with its legal base in Bermuda. A member of the Jardine Matheson Group it is a major pan-Asian retailer involved in the processing and wholesaling of food and personal hygiene products in the Pacific region including China. 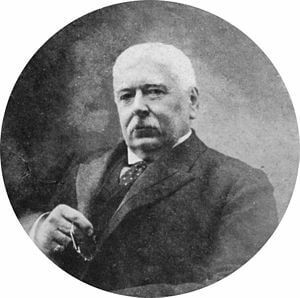 Jardine Strategic, a publicly listed holding company , has an attributable 78% stake in the firm. It is listed on the London Stock Exchange with secondary listings on the Singapore and Bermudastock exchanges. 1892 Dairy Farm establishes a Central depot in Lower Albert Road. The building now houses the Foreign Correspondents’ Club, Hong Kong and the Hong Kong Fringe Club. 1899 The company starts importing butter from Australia. 1900 It starts rearing pigs and fowl to provide pork, poultry and eggs and begins supplying in bulk to ships, hospitals and the military. 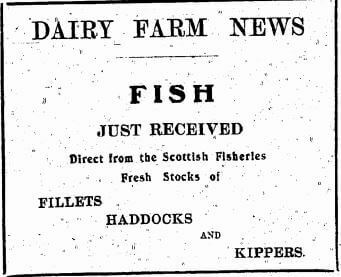 1904 Dairy Farm opens its first retail store at Lower Albert Road. It begins importing frozen meat from Australia. 1911 Dairy Farm buys Butterfield and Swire’s frozen food business, its first major corporate acquisition. 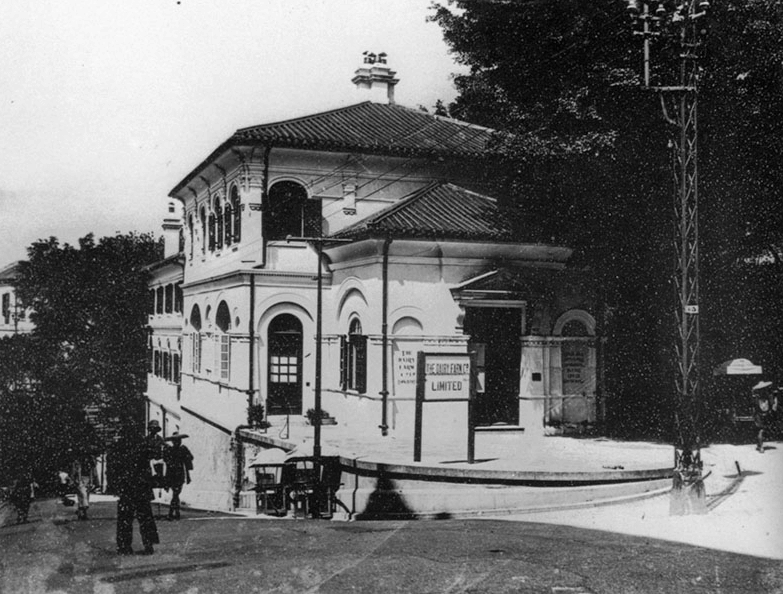 1916 The Central depot is reorganized to form Hong Kong’s first supermarket/delicatessen. 1918 The company opens a second store in Manson House, Nathan Road, Kowloon. It buys the Hong Kong Ice Company and changes its name to The Dairy Farm, Ice & Cold Storage Company Limited. 1924 A new ice factory s built at East Point. 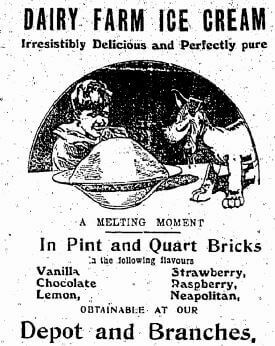 1928 The company is now producing 1,000 gallons of milk daily, plus fresh meat, cream and ice cream. It operates six retail stores in Hong Kong and delivers to consumers in Macau and the major coastal Chinese cities. 1941 It opens new offices in the first Windsor House on Des Veoux Road, Central. 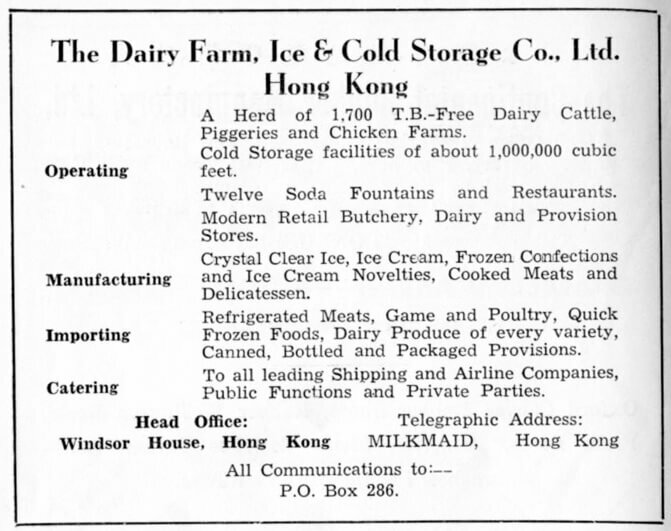 1946 Post WW2 Dairy Farm quickly recovers and records a net profit of HK$1,519,292. 1947 An aircraft catering kitchen at Kai Tak Airport is launched. 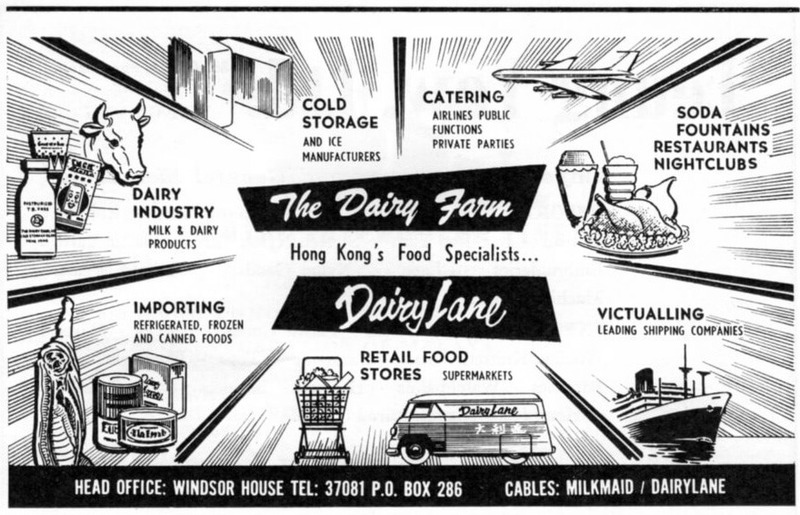 1960 Dairy Farm and Lane Crawford merged their respective food retailing operations to form Dairy Lane Limited. 1964 Dairy Farm acquiriesthe Wellcome grocery chain founded in 1945 by Wu Chung-hai and Lau Lin. It buys out Lane Crawford’s share of Dairy Lane Limited. 1967-1970 The company begins its overseas expansion. It takes stakes in various Australian companies. It opens an aircraft catering kitchen in Guam, buys the Simarloo fruit and nut farm, and a beef ranch in Australia, and expands its catering services to mining camps in Australia and Indonesia. It enters the wholesaling sector and extends its range of dairy products and frozen foods on sale. 1972 Dairy Farm is acquired by Hongkong Land. It retains its independence, its established operating structure and corporate personality. 1973 Dairy Farm acquires Singapore-based Fitzpatrick’s Food Supplies (Far East) Ltd.
1976 The company buys 51 percent of Manning Dispensary Ltd, a chain of three pharmacies run by a Hong Kong medical practice. Central Depot reverts to the crown, ending its 72-year association with Dairy Farm. 1979 Dairy Farm signs an agreement to obtain 18 tonnes of daily milk supplies from the Kwangming farm in Shenzhen. It acquires Franklins’ chain of 75 “No Frills” stores in Australia. 1980 Dairy Farm forges the first ever Sino-Foreign joint venture following Deng Xiaoping’s Open Door reforms. The joint venture operates the flight kitchen for Beijing Airport. 1983 Dairy Farm’s herd of cows at Pokfulam are sold off. The company begins disposing of its Australian farming and ranching interests. 1985 The company signs a Joint Venture agreement with the Guangdong Foods Industry Corp. to form the Guangzhou Refrigerated Foods Ltd and open an ice-cream factory. 1986 Dairy Farm’s Centenary. In December, the Company is demerged from Hongkong Land and re-listed on the Hong Kong Stock Exchange. As part of the demerger, Dairy Farm takes over 50 percent interest in Maxim’s from Hongkong Land. 1987 Dairy Farm acquires 25 percent of Kwik Save – the sixth largest supermarket chain in the United Kingdom. It begins supermarket operations in Taiwan. 1989 The company buys the 7-Eleven chain of convenience stores in Hong Kong from Jardine Matheson. It sells the Simarloo Farm. 1990 Dairy Farm obtains a dual primary share listing on the London Stock Exchange, soon followed by secondary listings in Australia and Singapore. Its primary listing in Hong Kong was later converted to a secondary listing, and was subsquently withdrawn in 1995. It acquires the 108-store Simago Supermarket chain in Spain and the 61-store supermarket chain, Woolworths, in New Zealand. 1992 The company opens five 7-Eleven stores in Shenzhen. It sells 51 percent of its dairy manufacturing businesses in Hong Kong and Guangzhou to Nestlé. Nestlé buys the Dairy Farm brand name and licenses it back to the Company for 50 years. 1993 Singapore Cold Storage, with a network of 142 stores, is bought. 1994 Dairy Farm signs a letter of intent to set up three supermarkets in Shanghai, Shenzhen and Guangzhou, and forms a 50-50 supermarket Joint Venture with Cold Storage (Malaysia). 1997 Dairy Farm opens a 50-50 Joint Venture with health and beauty chain, Health and Glow, in India and reaches a Technical Assistance Agreement in Indonesia, with Rajawali, to run the Guardian pharmacy chain. It sells its remaining 49 percent stake in Nestlé Dairy Farm to Nestlé. 1998 The company disposes of Kwik Save in the UK, the Simago chain in Spain and closes down Mannings in Taiwan. It buys 32 percent of PT Hero, a 71-store supermarket chain in Indonesia, and opens a Géant hypermarket in Taiwan, a Joint Venture with Casino of France. In Malaysia, it increases its stakes in the Wellsave supermarket chain and in the 59-store Guardian pharmacies giving it control of both. 1999 Dairy Farm buys 90 percent of Giant Malaysia with two hypermarkets and five supermatkets. In India, it acquires a 49 percent holding in the Foodworld supermarket chain. 2000 The company sells its 50 percent interest in DFI Géant in Taiwan to JV partner, Casino. It acquires 23 Apex stores in Singapore, which are folded into its Guardian operations, and expands its supermarket operations in Taiwan with the acquisition of 12 Maysoon stores. 2001 Dairy Farm completes the sale of Franklins and its Hong Kong-based wholesaling business, Sims Trading. It acquires the remaining 10 percent of Giant Malaysia. Its 65 percent-held JV, Guangdong Sai Yi Convenience Stores Ltd, becomes the first convenience store JV to obtain approval from the Central Government to operate in Southern China. 2002 The company completes the sale of Woolworths, New Zealand. It forms a 50/50 JV with the CJ Corporation, investing US$5 million in the health and beauty chain, Olive Young in South Korea. It acquires IKEA Hong Kong and Taiwan from Jardine Matheson. 2003 Dairy Farm buys the 22-store Kayo supermarket chain in Taiwan. Its Indonesian associate, PT Hero, acquires 22 Tops supermarkts from Ahold. It also acquires 34 Tops supermarkets in Malaysia from Ahold, which are rebranded as Giant and Cold Storage, taking the number of supermarkets owned by Dairy Farm to 47. In Singapore, it acquires 35 Shop N Save supermarkets increasing its supermarket network to 75 stores. 2004 The Daily Stop chain of convenience stores in Hong Kong is bought and rebrands them under the 7-Eleven name. It sells its last non-retail business, ice manufacturing. 2005 The company increases its attributable interest in PT Hero in Indonesia to 69 percent following two tender offers and the purchase of a minority shareholding. In India, it introduces new JV partners in Foodworld and Health and Glow. It enters the Thai market with the opening of its first Guardian stores. 7-Eleven and Mannings enter the Macau market in the same year. Dairy Farm posts an underlying net profit of US$190 million. 2006 Dairy Farm’s 120th anniversary. It marks the milestone by sponsoring the conversion of two of the original octagonal cowsheds in the old Pokfulam farm into a performance area and cinema space, named the Wellcome Theatre, by the Hong Kong Academy for Performing Arts. The facility contains a 150-seat auditorium and an adjacent foyer/exhibition area. 2007 7-Eleven South China acquires 110 Quik convenience stores in Guangzhou rebranding them as 7-Eleven. 2008 Manning China opens its first stores outside Guangdong province in Beijing City. During the year, Mannings China also extended its reach to Nanjing, Chongqing and Shanghai. The first Giant hypermarket was opened in Brunei. 2009 7-Eleven South China opens its 550th store in New City Zhujiang, Guangzhou on 16th October. Mannings Hong Kong reaches a milestone by opening its 300th store in December. 2010 Giant opens its first supermarkets in Brunei. 2012 Dairy Farm enters the Cambodian market through the acquisition of a 70% interest in a company that operates seven Lucky supermarkets and nine fast food outlets in the country. Dairy Farm also enters the Philippines market by acquiring a 50% interest in Rustan’s Supercenters, which operates ten Shopwise hypermarkets, 13 Rustan’s supermarkets and nine Expresslanes supermarkets. 2013 Shop N Save supermarkets in Singapore are converted to the Giant brand. Maxim’s opens its first Starbucks store in Vietnam. A joint venture is established to operate mini-marts in Malaysia trading as ‘G EKSPRES’. The first Guardian health and beauty store opens in Phnom Penh, Cambodia. This article was first posted on 11th November 2014.